The Xi was the hard-disk version of the cream-coloured Apricot PC. 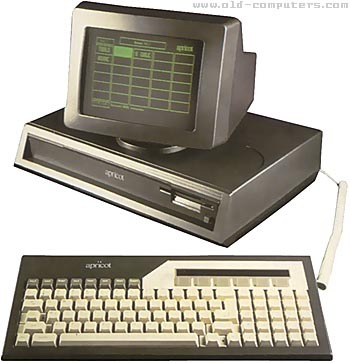 The keyboard could be clipped to the underside of the machine, and a little cover would slide over the front panel to conceal the floppy drive. A handle then slid out of the front (just under the ridge) that allowed it to be carried very easily. A colour screen was available - a re-packaged 10" Sony Trinitron screen that almost nobody bought because it was so expensive. The mono screens had an anti-glare coating consisting of a very fine nylon mesh stretched over the screen and held in place by the bezel. Anybody who made the mistake of spraying glass cleaner on it would regret it, as the cleaner just clogged up in the pores of the mesh and left a nasty stain on the screen, which could only be removed by dismantling the monitor in order to rinse the mesh in water. There was also a very rare model - coloured pale grey, which had a hard drive of 50 MB or thereabouts. Used to fix these machines, one very common problem on Apricot Xi was "wobbly screen" reported by user. The answer was to make a "bacofoil sandwich" as we called it! Take one aluminum foil strip, cover with packing tape to insulate, solder an earth wire onto one corner and stuff inside case, under where the screen sat. Hey presto, no wobble induced by PSU in main unit! Also the disk drives were prone to clogging up and getting generally dirty. The rear panel had 3 or 4 screws, one of which fitted into the metal 'bridge' that ran the width of the machine, and held the PSU and disk drives above the motherboard, which filled the base of the case. The bridge was partially supported by this real-panel screw, and would drop about half a centimetere when it was removed. The only way to reassemble the thing was to turn the unit upside down so that the bridge screw hole would re-align with the real panel. see more ACT Apricot Xi Ebay auctions !